Katie & Emily sampling the Raccoon River, May 2017. Challenge: Partners within the Watershed Management Authorities of Fourmile Creek and Walnut Creek will be implementing major infrastructure and restoration activities over the coming years with the intention of improving water quality and reducing flood risk in these streams. However, baseline data on the ecological status of the streams are scant, which limits the respective Authority’s ability to track progress towards their goals following their major investments in the streams and their surrounding watersheds. • We are measuring the ecological status of each stream at three locations across different land-uses using a suite of structural and functional metrics. The dominant land-use types in each watershed include agriculture, suburban, and urban. • Each location will have a suite of real-time sensors that measure dissolved oxygen concentration, temperature, turbidity, conductivity, nitrate, and discharge at 10-minute intervals. In addition, we will collect grab samples every two weeks to measure water chemistry, suspended sediments, and benthic chlorophyll. • We will work closely with the WMAs, providing frequent updates and reports to keep the partners informed of the status of the streams. Goal: Our study seeks to provide reliable, long-term data on the status of Fourmile Creek and Walnut Creek. Furthermore, as the Watershed Management Authority(ies) conduct in-stream and watershed projects, we will determine the degree to which water quality and stream health are improved, providing a holistic assessment of the WMA’s efforts and developing suggestions for future management actions. Status: Funding for the work was secured in early 2019 and fieldwork was initiated in April of that same year. The project will include three years of fieldwork. Periodic updates will be given at WMA meetings throughout the span of the project. Status: Our fieldwork will commence in 2019 and continue through 2021. Stay tuned for updates or feel free to reach out to Peter along the way. Challenge: The Raccoon River provides vital resources to Central Iowa communities and ecosystems along its course, including drinking water, recreational opportunities, and habitat for aquatic organisms. However, the river has impaired water quality with high sediment loads and dissolved nutrient concentrations. A thorough understanding of the dynamics in nutrient loads and losses can enhance river management by determining which environmental factors, such as weather or land-use, control these patterns at different locations and during different seasons in the lower Raccoon River watershed. • In our research, we seek to investigate the balance between nutrient load versus nutrient loss through space and time by sampling nine different locations from Redfield and Minburn to downtown Des Moines. • Every two weeks, we collect water samples to analyze various physical and chemical parameters, including sediment load, dissolved nutrient concentrations, conductivity, and dissolved oxygen. • Monthly, we measure sediment denitrification rates in the lab by collecting samples from three of our nine locations. Denitrification is a microbial process that permanently removes nitrate from the water by converting it to nitrogen gas. Goal: Our research goal is to quantify the variation in sediment and dissolved nutrients in the lower Raccoon River in space and time. Status: Fieldwork completed in December 2017. Data have been presented at multiple local, regional, and national conferences. Two manuscripts are in preparation for submission in 2019. 4. Does land conservation improve stream ecosystem health? Challenge: Stream and wetland ecosystems collect, process, and transport water from their surrounding watershed. Healthy streams and wetlands provide numerous important ecosystem services for society such as the ability to filter water, removing excess sediments and nutrients. Even streams that are close together on the landscape can contain varying concentrations of sediments and nutrients. We will compare rates of whole-stream metabolism, a metric that integrates watershed and stream characteristics, which we will use to quantify the ecological value of land conservation practices. 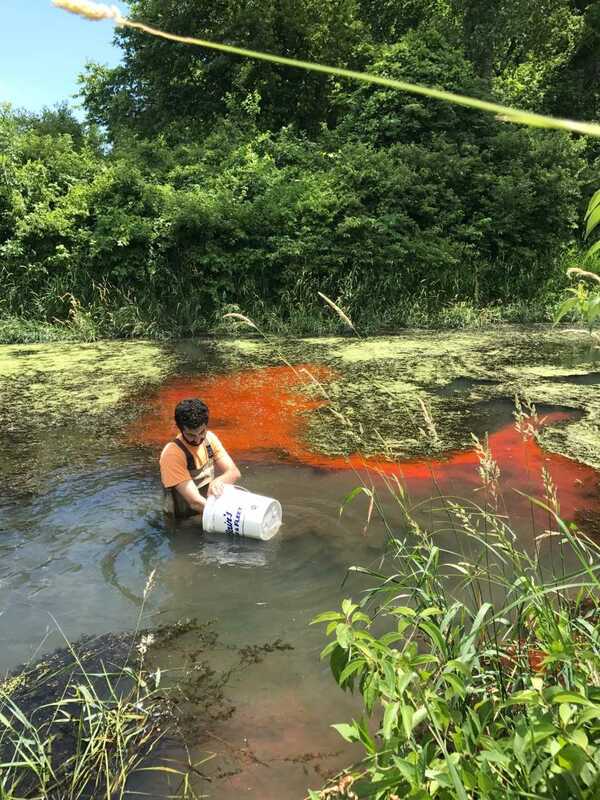 • We are conducting our research on six streams flowing in and around Chichaqua Bottoms Greenbelt, a conservation area located along the North bank of the South Skunk River. • To assess the health of streams, we are measuring a suite of physical, chemical, and biological characteristics of the ecosystems every two weeks across multiple seasons. • Upon completion of the research, we will analyze the data for patterns among streams and across seasons to determine the factors that drive whole-stream metabolism. Goal: We aim to understand which stream characteristics influence ecosystem health most strongly in order to inform the management and conservation of streams in Central Iowa. Status: Fieldwork completed in October 2018. Samples continue to be analyzed. Data have been presented at multiple local and regional meetings. Challenge: The availability of clean, safe drinking water in Uganda is limited, especially outside of the urban centers. The residents of rural communities often use surface water as a source of drinking water, but these ponds and streams are often contaminated by human and animal waste. Bacteria within the water may cause water-borne illnesses to persist in the population. Drake University has an on-going partnership in Kikandwa and has recently contributed to the establishment of a borehole for safe drinking water. However, there is still a high rate of water-borne illnesses within the village, suggesting that residents are not exclusively using the borehole for water or the water becomes contaminated between the borehole water and the homes. • We are collecting water samples from surface water throughout Kikandwa as well as treated and untreated water inside homes and analyzing them for E. coli among other bacteria. • Partnering with the Kikandwa Health Center allows us to gather accurate data on where community members on their sources of drinking water, how they treat it, and if they’ve had a water-borne illness recently. Health Center workers use a survey to gather community input. • The results from the water testing and the community survey will be used to investigate any link between social practices, water quality, and public health. Goal: Our goal is to provide a water-map of the drinking water sources in and around the village to aid efforts by the Health Center to limit the burden of water-borne illnesses on residents of the community. Status: Fieldwork has been completed in January 2018. Collaborative analysis of microbial communities is on-going with Dr. Shauna Kaplan in Drake’s Department of Biology. More data soon! 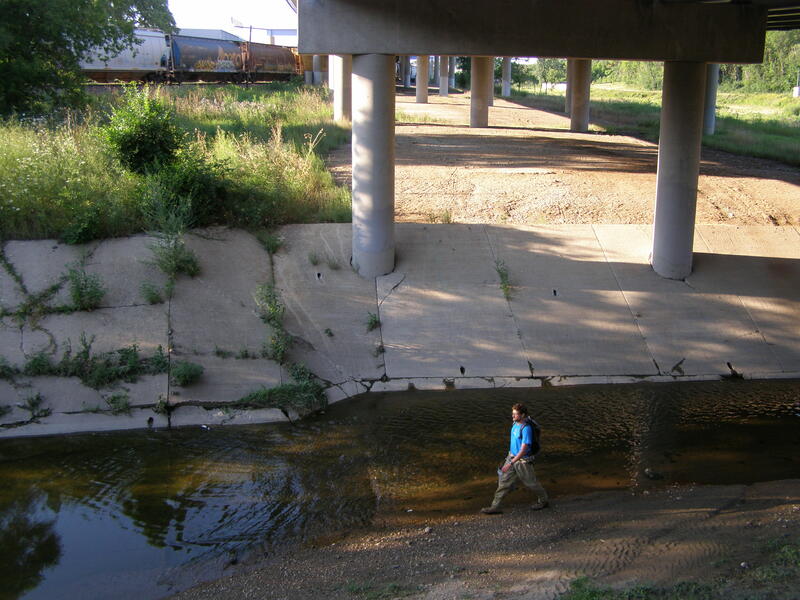 Peter strolling an urban stream during his post-doctoral research at UW-Madison (Underwood Creek, Milwaukee, WI; A. Hintertheur 2014).